Following Lincoln's election in November 1860 with only some 40% of the popular vote, one of his first tasks was to put together his cabinet. As described in the best-selling book Team of Rivals by Doris Kearns Goodwin, his choices would include all of his major rivals for the Republican nomination for President in 1860--William H. Seward, Salmon P. Chase, Simon Cameron and Edward Bates. Despite Lincoln's own orders to his close associates that they not make binding commitments for him prior to his nomination at the Republican convention in May 1860, some of these men had been led to believe that they had been promised positions by those they assumed to have the authority to act with Lincoln's approval. The group also represented stark contrasts in personality, ideology and ethics which Lincoln would be forced to balance as crisis faced the Union. This, then, is a story of Lincoln’s political genius revealed through his extraordinary array of personal qualities that enabled him to form friendships with men who had previously opposed him; to repair injured feelings that, left untended, might have escalated into permanent hostility; to assume responsibility for the failures of subordinates; to share credit with ease; and to learn from mistakes. Another historian, William Gienapp of Harvard, wrote that Lincoln's ability to manage the disparate group reflected his own self-confidence, a trait little-known upon his election. One reason Lincoln appointed so many rivals to cabinet posts is that he intended to rely on his own judgment rather than that of his advisers.... Confident in his ability to decide on the correct policy, Lincoln never felt bound by the prevailing opinion in the cabinet, and he rarely revealed his thoughts until he had made up his mind. William E. Gienapp, "Abraham Lincoln and Presidential Leadership," in We Cannot Escape History: Lincoln and the Last Best Hope of Earth, James M. McPherson, ed. On February 4, at a convention in Montgomery, Alabama, the seven seceding states adopt the Confederate Constitution, a document patterned after the United States Constitution, but stressing the autonomy of each state. Jefferson Davis is named provisional president of the Confederacy until elections could be held, and on February 18 delivers an Inaugural Address at the Alabama Capitol. On the same day as the start of the Montgomery Convention, a Peace Convention convenes in Washington at the initiation of Virginia, which had deferred acting on secession and was seeking a compromise that would avoid war. 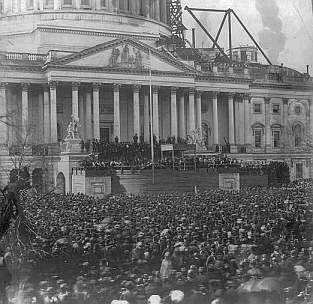 On February 11, Lincoln departs by rail from Springfield, Illinois, on his way to his March inauguration in Washington, making stops in various states on the way in which he attempts to reaffirm his desire to avoid war. Lincoln arrives secretly in Washington on February 23, after a plot to assassinate him in Baltimore is discovered. When President Buchanan refused to surrender southern federal forts to the seceding states, southern state troops seized them. 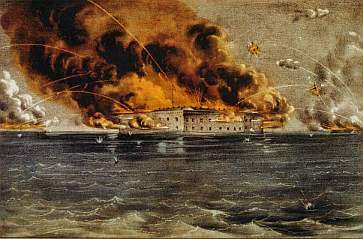 At Fort Sumter, South Carolina troops repulsed a supply ship trying to reach federal forces based in the fort. The ship was forced to return to New York, its supplies undelivered. After almost three weeks of deliberation, on February 27 the Peace Convention adopted and sent to Congress six proposed constitutional amendments, including a proposed extension of the Missouri Compromise line west to the Pacific Ocean. It was initially rejected, but on reconsideration, barely passed. Virginia, which had initiated the peace initiative, votes against the provision in the Congress. President Lincoln advises South Carolina that he plans to to send supplies to Fort Sumter in hopes of avoiding a confrontation, but the state demands that the commander of the fort, Robert Anderson, surrender immediately. After Anderson exhausts his supplies, his offer to surrender is rejected and on April 12, the Civil War begins with shots fired on the fort. Fort Sumter surrenders on April 15. On the same day, Lincoln issues a proclamation calling for Congress to reconvene on July 4 and requesting 75,000 troops to be used in recapturing seized federal property. Virginia, North Carolina, Tennessee, and Arkansas secede, and Richmond is named as the Confederate capital. On April 19, Lincoln proclaims a blockade of ports in South Carolina, Georgia, Alabama, Florida, Mississippi, Louisiana, and Texas. On April 27, Lincoln suspends the writ of habeas corpus along the line of troop movements between Philadelphia and Washington and extends the blockade to the ports of North Carolina and Virginia. ﻿Stephen Douglas dies in Chicago of typhoid fever at the age of forty-eight on June 3. After the firing on Fort Sumter, Douglas had spoken out in support of Lincoln's actions, and had widely toured the Midwest encouraging military enlistments, an effort which evidently weakened his health. Lincoln orders thirty days of mourning. Delaware, Kentucky, Maryland, and Missouri decline to join the Confederacy despite their acceptance of slavery. ﻿Congress reconvenes on July 4, and the President's war message is forwarded as a formal government document. Union's General-in-Chief Winfield Scott orders General Irvin McDowell to advance on Confederate forces stationed at Manassas Junction, Virginia. McDowell's attack on July 21 results in a Southern victory, with federal troops breaking ranks and retreating in panic toward Washington in the battle later referred to by Southerners as Manassas and by Northerners as the First Battle of Bull Run. General Winfield Scott resigns on July 27. Lincoln names General George B. McClellan as commander of all troops in the Washington vicinity. Lincoln expands the scope of McClellan's command to the entire Union army. ﻿On January 27, the President issues a war order directing that February 22 will be "...the day for a general movement of the Land and Naval forces of the United States against the insurgent forces." General McClellan ignores the order. ﻿Frustrated with General McClellan's inaction, Lincoln issues an order on March 8 reorganizing the Army of Virginia and relieving McClellan of supreme command. McClellan is given command of the Army of the Potomac, and ordered to attack Richmond, beginning a series of battles known as the Peninsular Campaign. On March 8, the ironclad ram CSS Virginia (the captured and refitted USS Merrimack), destroys two Union warships, the USS Congress and USS Cumberland, threatening Federal control of Hampton Roads. 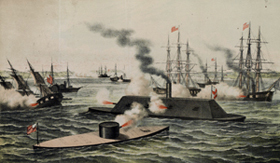 The threat is ended the next day, however, after the Union ironclad, USS Monitor, successfully blocks the Virginia's advance on March 9 in the famed sea battle. On April 6, Confederate forces attack Union forces under General Grant at Shiloh, Tennessee. By the end of the day, the federal troops were almost defeated. Yet, during the night, reinforcements arrived, and by the next morning the Union commanded the field. When Confederate forces retreated, the exhausted federal forces did not follow. The Battle of Shiloh results in the heaviest casualties of the War to that point: 13,000 of 63,000 Union soldiers and 11,000 of 40,000 Confederate troops were killed. 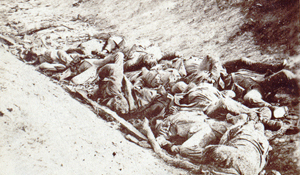 The total casualties at Shiloh are higher than the combined losses in all previous American wars. ﻿Flag Officer David Farragut leads a surprise flotilla assault up the Mississippi River, passing Confederate forts under darkness, and captures New Orleans on April 25. The Confederate Congress approves the Conscription Act imposing a draft of white men between eighteen and thirty-five years old for three years' service. ﻿General McClellan's troops occupy Yorktown, Virginia on May 4, but then halt their advance to await reinforcements before engaging the main Confederate army. McClellan later moves to a position only five miles from Richmond, but then retreats before attacking the city. ﻿Confederate General Thomas J. "Stonewall" Jackson attacks Union forces in the Shenandoah Valley in late March, forcing them to retreat across the Potomac. Additional Union troops are ordered to protect Washington, D.C. against a possible attack. On May 31, the Confederate army attacks federal forces in the Battle of Seven Pines, but the Union escapes a serious defeat when last-minute reinforcements arrive. Lincoln calls into military service 300,000 volunteers and approves an act providing for a tax of three per cent on incomes in excess of $600, the first federal direct tax on income. On July 11, Major-General Henry Halleck is named general-in-chief of the Union army. ﻿Union General John Pope is defeated in the Second Battle of Bull Run on August 29-30. Union forces under General McClellan defeat General Lee at South Mountain and Crampton's Gap in September, but McClellan acts too slowly to save Harper's Ferry and the federal arsenal, which is taken by Stonewall Jackson on September 15. On September 17, Lee's army engages McClellan near Sharpsburg, Maryland. The Battle of Antietam proves to be the single bloodiest day of the war: 2,108 Union soldiers were killed and 9,549 wounded and 2,700 Confederates were killed and 9,029 wounded. Lee retreats to Virginia, but McClellan fails to pursue. The battle gives Lincoln the opportunity that he had been waiting for to announce his Preliminary Emancipation Proclamation on September 22, which would free all slaves in areas rebelling against the United States effective January 1, 1863. McClellan's reluctance to pursue the attack on Lee's army following Antietam provokes Lincoln on November 7 to dismiss McClellan, replacing him with Major-General Ambrose E. Burnside.